The 2014 Winnebago Travato is one of the newest additions to the Winnebago class b lineup. For those looking for a fully functional and luxurious RV, the 2014 Travato may be the perfect option. Measuring at 20′, the Travato offers the full RV experience while still being agile and easy to drive. Winnebago designs its RVs with luxury in mind. The 2014 Travato is designed to offer the most while utilizing the space it offers. For example, the 2014 Travato is equipped with a FlexBed that can be converted into either two twin beds or one single queen size bed. Not only that, but the bed is also made with drawers beneath the bed for additional storage. 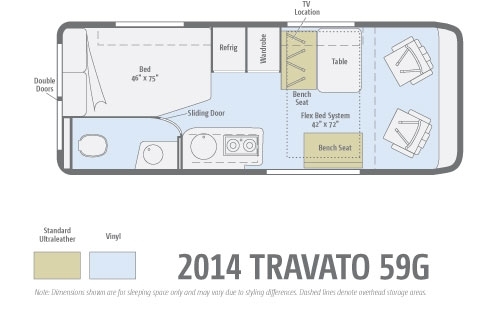 Furthermore, the 2014 Travato offers several storage compartments, both on the interior and exterior of the RV. Of course, in addition to offering plenty of storage space, the Travato was designed to most efficiently use the space it has. As a result, many of the features of the RV, such as the dining area, is equipped with extra storage and flip-up seats. While the 2014 Winnebago Travato has many interior features, the exterior of the RV isn’t too shabby either. Designed for the best experience and comfort possible, the exterior of the RV is equipped with features such as patio awning, an exterior speaker system, and an automatic entrance step. Whether you want to have a dance party or a relaxing campfire, the Travato can meet your needs through its unique features. While the 2014 Winnebago Travato is designed to ensure that you have a fantastic time on any adventure, the RV is also designed with safety features that help ensure that all passengers are safe. Safety features include child seat tether anchors, smoke and carbon dioxide detectors, fog lamps, and a high mount brake lamp. Whether you’re a thrill seeker or simply want to take a relaxing vacation, the 2014 Winnebago Travato may the perfect RV to fit your needs.